Padre Pio was born in 1887 in the small town village of Pietrelcina, Italy. At the age of five, the Sacred Heart of Jesus appeared to him in their parish church in Pietrelcina and later still as a child, his power of healing spread around when he was able to heal a young boy at the brink of death. Even as a boy, he already had visions of Jesus and Mary and experienced attacks of the devil. He joined the Capuchin friars at the age of sixteen and was ordained a priest seven years later. For fifty years, Padre Pio had the stigmata (the wounds of Christ) like St. Francis of Assisi but unlike St. Francis who was a deacon, St. Pio became the first and only priest with the stigmata in the history of the Church. Jesus pointed to a multitude of priests and said: “Butchers.” He asked Padre Pio to share in His agony and passion and to make reparation for sins, especially the lack of response of priests. He was given a visible stigmata, a sharing in Christ’s passion and suffering. Saint Pio suffered for 50 long years with this stigmata, his pierced hands nailed with the Cross of Jesus as he bore the wounds of Christ’s Passion. Thousands visited the holy friar when he was still alive to be cured of their bodily and spiritual ills. Even more visit his tomb today. It is said that after Our Lady’s Grotto in Lourdes, the tomb of Padre Pio in San Giovanni Rotondo is the second most frequently-visited pilgrimage site in the world. Padre Pio himself was a great devotee of Our Lady. One day, it was the feast day of Our Lady in his own town at Pieltrelcina. Saint Pio was already old that time and could not leave San Giovanni Rotondo to travel to Pieltrelcina. He asked the young Capuchin friar taking care of him to leave him and instead go to Pietrelcina to attend the fiesta celebration there. The holy priest would say, “As the Son of God made man and called Jesus came to us through Mary, so it is through Mary that we go to Jesus: Ad Jesum per Mariam.” For him, the more consecrated the soul is to Mary, the more consecrated it is to Jesus Christ. Enraptured by the splendor of the consecrated Host, he would kneel in ecstasy before the Blessed Sacrament. He wrote in a letter to Padre Agostino in 1912: “I often ask myself if any people exist who do not feel their breast burning with divine fire, especially when they are close to Him in the Blessed Sacrament.” (Padre Pio, Letters 1,357). He would spend countless hours before Jesus in the Holy Eucharist, from Whom came his powers of healing, bi-location, conversion and prophesy. Padre Pio was known as a confessor and spiritual guide. Cardinals, bishops, priests, the royalty, state leaders, and the laity, would go to him from all parts of the world for confession and spiritual guidance. Later, he told Fr. Karol Wojtyla: “We better pray hard together that you become a very good and holy HOLY FATHER of the Church.” And that was what became of Fr. Karol thirty years after his encounter with this saintly stigmatist. 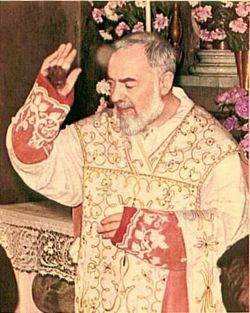 Saint Pio would challenge priests today to choose God above all and to live a life worthy of their calling and vocation as the ones chosen by Christ to live a life of holiness. 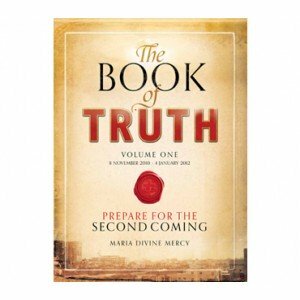 …The miracle that happened to Padre Pio will happen to you. Look at how famous he was; he gathered people from around the world to himself. But why? Because he was a philosopher? Because he was learned? No, because he said Mass humbly; he would hear confessions from morning to night, and he was… a representative of our Lord marked with the imprint of His wounds. He was a man of prayer and suffering. One seeks God in books, one finds Him in prayer. If today one no longer believes, a lack of prayer must be blamed. God is not found in books, but in prayer: the more we pray, the more our faith grows and we find God… You, children, do not neglect prayer; pray often during the day. Do a bit of meditation. You will find and see God. In the school of this great saint, we learn the way in which to pray, to hope and not to worry but instead to trust God at all times. Click here to return from Padre Pio to Roman Catholic Saints.